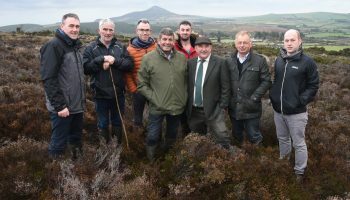 Wicklow Uplands Council officially launched the ‘Sustainable Uplands Agriculture-environment Scheme (SUAS)’ Pilot Project on Monday evening at a special event held at The Glendalough Hotel, Co. Wicklow. Full details of the €1.95 million project designed to assist both commonage groups and individual farmers across the Wicklow and Dublin uplands, were shared to the large audience who attended. Presentations were given by a number of guests, including Minister of State for Food, Forestry and Horticulture, Andrew Doyle and CE of The Heritage Council, Michael Starrett. The project, the first of its type in Ireland, was successful in securing funding under the first round of European Innovation Partnership for Agriculture, Productivity and Sustainability (EIP-AGRI) initiative. In two highly competitive Open Calls for proposals, 21 selected projects have been allocated funding over the last 12 months under Ireland’s Rural Development Programme 2014 – 2020. The project has evolved following several years of extensive study which identified the poor-to-bad conservation status of the habitat found in the Wicklow/ Dublin uplands. The study also found a decline in the use of the uplands for livestock grazing and the need for specific support for upland farmers. Following the announcement of the project earlier this year, a selection process resulted in three commonage groups and one individual farmer been chosen to participate in the initial roll-out of the project. An announcement for a further expressions of interest is due in 2019. The project has created a framework that consists of a facilitated process to assist the participating groups to form their own constitution and to establish as a formal structure. It is the commonage group itself that collectively develops and agrees to a management plan with the support of the SUAS operational group. Participants will work closely with Faith Wilson, an ecologist who will monitor and advise on the improvement of the ecology and water found on the selected sites over the duration of the project. SUAS will also be organising training courses and necessary support required by participating farmers. The EIP-AGRI initiative in Ireland is being implemented by the Department of Agriculture, Food and the Marine (DAFM). EIP-AGRI projects are centered around a locally led operational group, which involves the cooperation of farmers, scientists, advisors, NGOs and others, coming together to address a specific issue or to take advantage of a new opportunity.